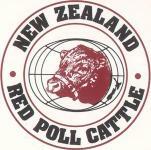 Red Poll cattle are a deep red colour with good eye and udder pigmentation (to avoid sunburn) and are naturally polled. They are medium size (similar to all British breeds) with strong legs for good mobility. Both cows and bulls are very docile and so are easy to handle, they are easy calving and because of their milking ability they produce a low weight, fast growing calf. For these reasons the bulls are used as dairy beef sires plus the cows frequently produce calves still at the age of 15 or more. The beef is fine grained and has gained a reputation for being the most tender and tastiest beef as judged by a consumer panel in Australia. Red Poll cows are still milked in England - their milk has a small fat globule so it is considered the next best to goat's milk for people that are allergic to cow's milk. RED: Distinctive deep red colour with good eye and udder pigmentation avoids sunburn problems. No cancer eye. POLL: Natural poll avoids carcass bruising and handling problems. MEDIUM SIZE: of the breed combined with rapid calf growth rate makes Red Pod cows extremely productive relative to fodder intake or area of pasture required. FORAGING ABILITY: Good legs and walking capacity have made Red Poll at home in the semi-arid zones of South and Western Australia, the big country of Northland, Taihape, Taumarunui and Southland, or the plains of Canterbury and Middlemarch. LONGEVITY: Red Poll cows frequently have 15 calves or more, and, consequently, fewer breeder re- placements are required and a profitable local market can be established for surplus heifers. 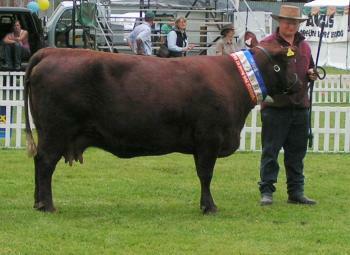 MOTHERING ABILITY: of the Red Poll female is unsurpassed by cows of any other breed. Calves are suckled until 9 or 10 months old for the vealer trade without difficulty. DOCILITY: of both cows and bulls is legendary. CALVING EASE: from 24 months (depending upon supervision and heifer development) minimises the number of assisted births and ensures extremely high five calving percentages every year. HIGH MILK PRODUCTION: of the Red Poll cow with excellent butterfat content guarantees a rapid growth rate for calves and ample finishing capacity for vealer production. Red Poll: cows with low replacement requirements and low veterinary support costs make ideal mothers for use in either purebred or crossbred programmes. Although the breed has gradually increased in Muscle and Scale, the Red Poll still maintains its superiority as a feminine breed, and is an obvious choice where improvement of fertility and milking ability is required, particularly in regard to cross breeding programs. The Red Poll cow is the ideal suckler dam, having been selected over the centuries for the maternal traits of high milk yield from rough forage, early maturity (first calf at two years old) and short calving interval. She is capable of calving the progeny from the more muscled terminal sires without assistance. COLOUR: Colour must be red, deep for preference. A sandy colour is an objection though not a disqualification. White markings are permissible on females on the udder attachment only, and on males on the extreme upper part of the scrotum. A white or silver-hared brush of the tail is permissible. SIZE: Males: Skeletal or frame size should be medium to large. With good height, a balancing length and adequate body capacity is required together with depth of rib, substantial bone and a symmetrical leg size to fit this body. Females: Skeletal size should be comparative to the male, with ample scale for age (not coarse) with plenty of length and width, particularly from hips to back. HEAD: Masculine and strong in the male, feminine and refined in the female. Head should be broad, of moderate length, and slightly dished. The eyes should be full, wide apart, well hooded and placid; the nostrils wide and open; the jaws should be wide, deep and strong (not undershot or overshot). The poll should be well defined with ears well set on the head and of medium size. There should be no evidence of horns or scurs. NOSE: The nose should be flesh coloured. Should it be black this is a disqualification. Any blue nose along with any black or blue spots constitute an objection according to their size. THROAT: Clean and free from excessive loose skin. NECK: Males: of medium length, muscular, with moderate crest, spreading out to meet the shoulders. Females: Female's shoulders should be smooth and sloping, well filled behind and not open at the top. CHEST: Obvious, but not excessive, broad and clean with minimum of loose skin. RIBS: Well sprung from backbone, neatly joined to crops and loins, bones well covered. Rumps long from hip to pin bone, broad level and full. Pin bones should be set wide apart. HINDQUARTER: Full, thick and muscular showing greatest thickness through stifle area. TAIL: Should come neatly out of the body and hang at right angles to it. LEGS: Forelegs well apart and straight with strong cannon bone of moderate length and with muscular forearm. Hindlegs slightly inclined forward below the hocks with clean strong flat bone. Hocks correctly set, strong and clean cut. Legs should be well placed on the corners of the body and relatively wide apart. Length of leg to be in proportion to size and length of the animal. FEET: Feet should point straight ahead, with short straight toes of equal size and deep heels. FLESHING: Deep, smooth and firm, without patchiness, with smooth even fat cover. SKIN: Soft, loose and pliable of moderate thickness covered with good quality fine hair. SHEATH & SCROTUM: Should not be loose or pendulous. Testicles of moderate to large even size, and hanging freely without twist, with well developed rudimentary teats in front of the scrotum. UDDER: Should be well developed, being long from front to rear, wide and deep, but neither pendulous nor fleshy. It should be firmly attached, extending up behind and forward in front. The quarters should be even, the sole level with no excessive undulation between teats. The teats should be of medium size, neither too long nor too short, but very slightly tapering, set evenly in the centre of leach quarter of the udder and pointing to the ground.